On Tuesday, January 9, 2018, at 1:00 PM the Maine Legislature Joint Standing Committee on Appropriations and Financial Affairs will hold a public hearing on L.D. 1510, An Act to Authorize A General Fund Bond Issue to Fund Wastewater Infrastructure Projects for Ratification by Voters in the June 2017 Election. (This bond was carried over from the last legislative session, if approved, the vote date would be modified.) This bond, if approved, will provide grant funds for wastewater infrastructure. The bond has broad support from a coalition of entities, including the Maine Water Environment Association and the Maine Rural Water Association. The fact sheet below provides the details on this important bill. The Legislature is scheduled to hold public hearings on twenty two different bond proposals over a three day period. The Legislature will face difficult decisions on what, if any, bonds to approve and send to the voters. If you are interested in this issue you should consider voicing your opinion to your local Representative and Senator and members of the Appropriations and Financial Affairs Committee. You can find Legislative contact information at these links. Clean Water is Worth It! • The $50,000,000 bond will fund three wastewater infrastructure /water quality grant programs at DEP that provide grants to upgrade municipal/ quasi-municipal wastewater infrastructure (treatment plants, pump stations, sewer systems), remove overboard discharges and repair/replace malfunctioning septic systems that impact surface water. • There are approximately $1 billion of known needs to upgrade Maine’s wastewater infrastructure. 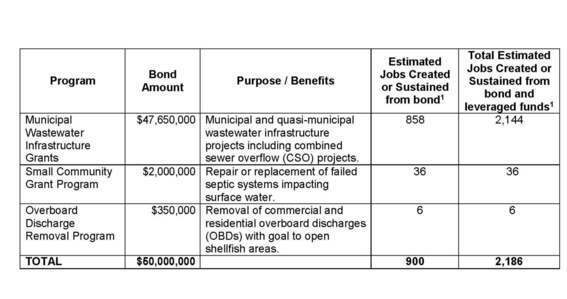 The bond will fund approximately three years of DEP’s ten-year wastewater infrastructure plan. • All three programs create jobs, improve water quality, and protect and/or open shellfish areas. The Department of Marine Resources is supportive of all of these programs. • These bond funds will leverage other federal and state funds to facilitate important wastewater infrastructure projects. An approximate estimate of the leveraging potential is 150% or more, resulting in total bond and leveraged funds of approximately $121,475,000. • From 1992 through 2009, there had been consistent legislature and voter approved support for bonds for these programs. These programs have not been funded since 2009. • A broad coalition of stakeholders support this bond due to the multiple benefits of job creation, environmental protection, improvement of shellfish harvesting areas, and municipal/ quasi-municipal infrastructure improvement. • Shellfish harvesting jobs: In addition to the jobs noted above, abating combined sewer overflows, removing overboard discharges, and repairing/replacing malfunctioning septic systems all have the potential to open closed shellfish areas so they can be harvested. (1) “How Infrastructure Investments Support the U.S. Economy: Employment, Productivity and Growth” Political Economy Research Institute, January 2009, p. 25. Table 3.1 estimates 18 jobs created per $1 million infrastructure investment. • Maintenance and upgrading of this “invisible”, yet essential, infrastructure is critical to protect public health, to protect water quality, and support economic growth. • The Maine Section of the American Society of Civil Engineers (ASCE) rated Maine with a grade of D+ for Municipal Wastewater Infrastructure. The lack of funding for infrastructure investment and proper maintenance adversely affects Maine’s ability to protect water quality and public health. There are approximately $1 billion of known needs to upgrade Maine’s municipal wastewater infrastructure. Wastewater infrastructure (wastewater treatment facilities, pump stations, and sewer systems) is typically the highest value asset a community owns and in some circumstances, cannot be affordably sustained solely through local rate payers. Based on current known needs there are numerous projects that are good potential candidates for grant funding. Once the bond is approved, DEP will solicit detailed project requests to determine how the grants will be awarded. Project requests will be evaluated using longstanding DEP criteria including economic need, shellfish area protection and improvement, abatement of combined sewer overflows, water quality improvement, regionalization, and leveraging bond funds with other state and federal funding sources.